Host Your Own Twitter Chats to Rocket Your Following! Last week, I gave you some tips on how to join Twitter chats. How did it go? Did you find some good ones? Drop me a comment or an email and let me know! 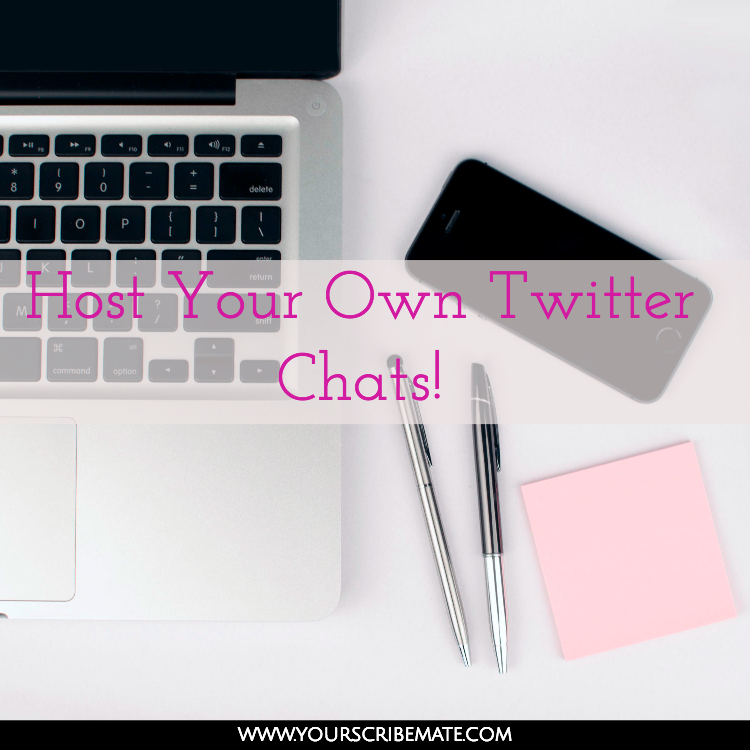 This week, I’ll give you some tips on how to host your own Twitter chat. This definitely shouldn’t be your first step, though. Participate in a few Twitter chats before you try to host one. Make sure you have that part of it down cold before you move on to hosting. Show yourself to be an expert in your field. If you’ve even considered hosting a Twitter chat, go for it! No idea how to do that? Keep reading! Decide what you want to name your Twitter chat, then check the hashtag to make sure it’s one that isn’t actively being used. If you find one that has a few random tweets from 2014, you’re still ok. Try to put “chat” on the end of it, too, but keep the character count in mind. If I were hosting one, #scribechat would be fine. #scribematevirtualassistingtwitterchat would not. I assume that at least part of your reason for hosting a Twitter chat is to grow your own following. Keep that in mind when you’re picking a topic. You want something that’s relevant to the following you currently have, and the followers you’re trying to gain. Make sure it’s up-to-date or evergreen, not something that’s too trendy and won’t be in any conversations a week from now. Check your own blog and the blogs of influencers you follow for ideas if you’re stuck. And, obviously, make sure the chat is relevant to your industry. If you’re a parenting blogger, there’s not much point to hosting a Twitter chat about the best nail polishes of the week. And keep the topics neutral. It’s ugly out there right now, so try to avoid any topics that could potentially turn off your participants. Next, you’ll need to come up with the questions you want to ask the chat participants. Make sure you ask enough to keep your participants engaged, but not so many they can’t keep up with all of them. Make sure the questions are open-ended, not yes/no questions. You want to keep the conversation going, and close-ended, yes/no questions aren’t going to do that. Allow a few minutes between each question so that your participants can not only answer your question, but can also read the answers of the other participants and react/engage with them. Remember, part of the reason for them to be participating is to build their own following, so they’re going to be trying to get some engagement as well. Ask a variety of questions, but make sure they’re all related to your topic. And don’t forget about Twitter’s 140 character limit! How many questions should you ask? Well, that’s really up to you. You want enough to keep the conversation flowing, but not so many that your audience gets frustrated trying to keep up with them. Sprout Social has a great Twitter chat, #sproutsocial, Wednesdays at 2:00 CST, and they usually do 5 or 6 questions during their hour long chat. 10 minutes between questions is a good amount of time for people to stay engaged. When should your chat be hosted? Again, you’re going to want to take your audience into consideration. If your chat is business related, try to find a time during the business day, maybe around lunchtime, or late afternoon when people are already winding down for the day. Check out other, similar chats as well. If your chat is about building a social media following, try not to schedule it at the same time as the Sprout Social chat I mentioned above. That’s a pretty popular one, and you don’t want to try and compete with them. Tweet about it. A lot. One tweet in the vast ocean of tweets that is Twitter isn’t going to do much. Tweet directly at your current followers to let them know it’s coming. Add the name of your chat and the date/time to your Twitter header. As the chat goes on, create a Twitter list of participants. Then before the next one, tweet at them and remind them it’s coming up. Create images for each chat. You can use a standard template, but change the date and time to be current for each chat. I’m sure there are so many other ways to promote your Twitter chat. Let me know what you come up with. As the chat goes on, make sure you’re not just dropping a question every few minutes and moving on. Like tweets, retweet them, reply to people, engage with them. That’s the whole purpose of this chat, right? Not only to show off how smart you are, but also to engage with people and gain some new followers. You can only do that if you participate in the chat. Don’t just shut down your computer when your chat is finished. Follow up with people! Call them out by name and thank them for coming. Tell them how excited you were to see them and make sure you’ve created a list with their Twitter handles on it so you can follow up with them. Once you’ve done this a few times and you’ve gotten the hang of it, start keeping track of the best and most popular tweets from your chat. Retweet them and share them in the days and hours leading up to the next chat to help promote it. You can even use them in a blog post you write recapping the chat for your email list. One last thing – the native Twitter platform isn’t very easy to use for hosting or participating in Twitter chats. There are several tools you can use, but I recommend something like TweetDeck or Twubs as the easiest ways to do this. So what do you think? Are you ready to host your own Twitter chat? If you are, drop a comment below and let me know what it will be so I can be sure to check it out!